I had been nurtured to be judgmental about people, thanks to my mom. Well, it is after all, the subtle 'risk hedging strategy' (Sorry, can't help. I'm so averse to management jargon) of a common lower-middle class housewife to ensure that her son doesn't deviate from the path of good behaviour that she taught him since childhood. I'd have professionally turned a magistrate or an advocate, blessed are my heart and mind, my inherent interests directed me towards the field of Engineering. I have lent my ears to quite a few debates on "judgmental versus opinionated". I should thank my primitive mind for not being able to distinguish the two. I always felt that opinions ultimately lead to judgments. So, to me, they do not make any difference. I came across this picture in a mail from one of my colleagues. 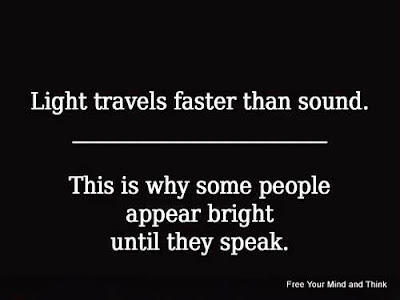 I often feel that this is very true. This reminded me of the opening scene from the telugu movie 'Satyame Sivam' (Anbe Sivam in tamil) wherein Madhavan mistakes Kamal to be a terrorist looking at him. And Kamal satirically responds, "Mr. S.Nand (Satyanand is Madhavan's name and he likes being called Nand) Terrorists never look like me, with scars on the face and a scary get up. Most of them look as handsome and decent as you." So true. 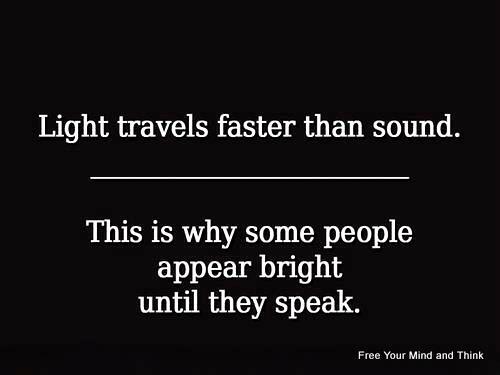 Light travels faster than sound. So, many times, we make judgements just by looking at people even before we know who they are. Even I have come across few such experiences. I have a uniform that I wear to work. So, many times, while walking to and from office, I come across as a machine operator to some passers-by. But that doesn't change what I am. One old man was sitting with his 25 years old son in a train. The train is just about to leave the station and all the passengers are settling in their respective seats. The young man was feeling ecstatic and curious as the train was leaving the station. He was sitting by the window side. He put his hand out and felt the fresh air passing by. He started getting excited and said "Papa, look. the trees are all moving behind". The Old man just smiled gently and admired his son's feelings. A couple was sitting and listing all the conversation between the father and the son. Suddenly, the young man shouted again. "Papa, see the animals and the lake. See the clouds. See the road there. It is really looking so beautiful." The couple were watching the young man in embarrassment. In the meantime, it started drizzling and the fresh drops of rain were splashing against the young man's hand. He closed his eyes and was filled with joy and delight. "Papa, see the water touching me. It is raining." shouted the young man. The couple asked the old man, "Why don't you visit a doctor and get your son treated." to which the old man replied, "We were returning from the hospital as today, my son got his eye sight for the first time in his life." This is a classic example of quickly making judgements from seeing one-time glimpses. Many times the truths get hidden behind the over-confidence of our momentary observations. So, the quicker we refrain from drawing quick conclusions, the better life will be for us. Let's brush our Egos aside. Let's be wise enough to learn from other's experiences but at the same time, burn our fingers a little to taste our own reality, coz one man's food is another man's poison.